A Shepherds Tale: The First Woolly Jumpers!!! In August 1994 thanks again to the Ladies at Travail Manuel , we met a local sheep farmer and bought our first sheep. As we had never kept sheep before it seemed wise to start small, so we settled on EIGHT ewe lambs [agnelles] they would have been about 8 months old when we collected them from the farm. Unfortunately I didn't take any photos of them at the time but you will meet them all eventually. We had already asked the farmer for as much info as possible on how to look after them, everything noted down in my notebook. Although I drew the line at bringing them into the house each night we did try and follow his other advice!!!!!!!! One of the first tasks before they encountered the ram for the first time in their lives, after the hairdresser of course, was worming. This involves catching each ewe and forcing a liquid down her throat, preferably without choking her because it's gone down the wrong way! SIMPLE you might think WRONG !!!!!!! These ewes had not been handled and had no intention of starting then, we had to try and herd them into a small building and then chase around until we caught them. When you are not used to dealing with wild animals, oh and they were certainly very cross by the time we had finished with them, it took us a long time but eventually they had all been wormed. I think I probably had been aswell but it didn't seem to do me any harm, hmm well actually!! Next job FLUSHING , by this time we had bought a book called "Sheep Keeping for Small Holders" now I know I'm only 5ft 1in but I thought that was a bit personal. Flushing involves extra feeding for the ewes for three weeks before the ram goes in and continues while he is with them. 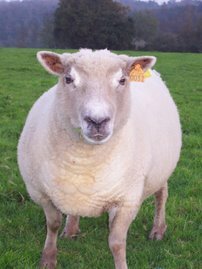 As we only had 8 ewes we had borrowed a ram, he was actually called Snow White [Blanche Neige] !!! named by the farmers children or so he said!! He joined our little troupe on the 4th of November. Now to make it easier to know when the ewes are going to lamb the book recommended a harness for the ram, this has a "crayon" which marks each ewe as she is served by the ram. As we had never fitted one of these before we decided to find a model to try it out first, and not for the last time the OH was called on!!!! It's at times like this that he is very relieved that we don't have any neighbours, otherwise he wouldn't have been able to show his face in the local bar. Well Snow White did his job with his 8 dwarves I mean ewes and went home, we then had approx. 147 days to wait for the proof of his endeavours. You create a very vivid picture!!! it's great.